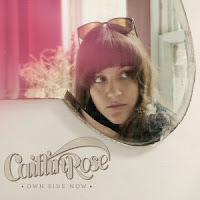 When an album is described as "country", it can unfortunately bring out the musical snob in people but Caitlin Rose’s very likeable 'Own Side Now' puts any such reaction to shame. There is great soul in her voice far beyond her 23 years, which moves the listener with tales of broken hearts and longing. Unsurprisingly hailing from Nashville, Rose has managed to construct a thoroughly modern country record, which incorporates elements of the indie scene to create something truly original. As lovely as the She & Him records have been, there has always been a nagging suspicion about their authenticity but that’s never in doubt with 'Own Side Now'. The opening two tracks are a pretty introduction to the album but doesn’t prepare you for the brilliance of 'For The Rabbits' as Rose despairs about the end of a relationship, singing "Fall back into my desperate arms / Fall back into this sole disaster / because it's better than spending all your nights alone". The song is symptomatic of a vulnerability which pervades the whole record. 'New York' is a jaunty ditty which reflects this is an artist is equally adept with the ridiculous and the sublime. It’s followed by 'Spare Me', which contains the quite brilliant lyric "Love is just one more useless thing you don't need, but you can't throw away". The quality of the songs is such that her cover of Fleetwood Mac 'That’s Alright' doesn’t need to stand out. The album concludes with the poignant acoustic 'Sinful Wishing Well' which finds Rose singing defiantly "In the dark, you know I've seen it, but you know that I don't mean it from the bottom of my angry broken heart", and 'Comin’ Up', which is a hoot, beginning as a little heartbreak tune which morphs into a wonderful slice of fun, uproarious country. Rose is truly a precocious talent and one hopes this debut album is the start of a legacy which will make comparisons to Lucinda Williams, Stevie Nicks and Emmylou Harris even more apt. 'Own Side Now' was released last year in the UK and can be purchased at Amazon.co.uk, and now at Amazon.com etc.